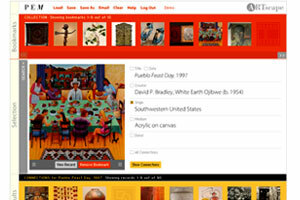 ARTscape is a powerful experiental tool that uses PEM's objects as a launching point for a user's self-guided journey through art and culture. Data in ARTscape includes photos and descriptions of objects in PEM's collection, definitions, book excerpts, quotations, video clips, and audio clips. Flash 6 required.